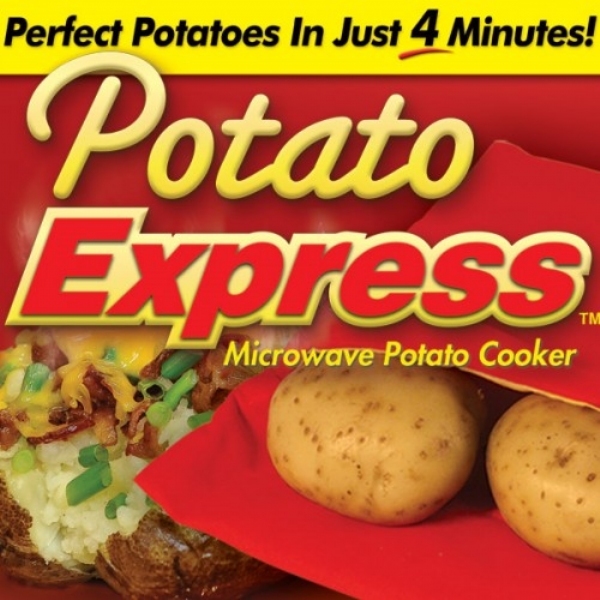 Get perfect oven baked potatoes in just 4 minutes with Potato Express. Potato Express works on any type of potatoes - white, red, sweet, yams and more. Holds up to 4 large potatoes. Reusable and machine washable. Potato Express is great for potato skin, potato salad, homes fries, mashed potatoes or any of your favorite style potato. Also, perfect for cooking corn right in the husk or saving hard day old bread! Includes 1 Potato Express and Gourmet Recipe Guide. Make sure your raw potatoes are room temp. Wash them and put in bag. Simply microwave and it works like a charm. Good stuff! Our first attempt was wrong since we had potatoes in fridge the middle did not cook. So simply make sure they are room temp and it works just perfect! Very happy with this product! When I use this product, I cook the potato/potatoes for only the 4 min. I then take them out of the microwave and wrap in foil and set it/them on my counter until the rest of my meal is done. At that point they continue to cook so I do not EVER have to cook them for any additional time. I have been using this for over 8 months and I still just love it. I was a little skeptical of the Potato Express, but it looked so easy and I love potatoes, so decided to try it. Very glad I did, now I have one of my favorite foods EASY AND QUICK!! I took two full size potatoes, washed them and put them right in the bag (no drying necessary) and then right in the microwave. Entered 4 minutes and pushed start...went to do some other things and when I came back the potatoes were perfectly cooked...what I like most is the simplicity coupled with the the great results. "Just set it and forget it!";-))). Great quality durable product looks like it will hold up nicely over time. Takes longer than stated but quicker and a lot better than plain microwave. Potatoes for 4 take about 7 to 10 minuets depending upon size. Still better than without bag. Potatoes come out much better and I am anxiously waiting to see how it performs on corn on the cob! This product makes it easy for seniors to easily make a baked potato. Love how easy it is to cook white potatoes and sweet potatoes. Love the short time that necessary to bake in this express potato. Really makes it so easy to have a baked potato anytime. Great product. Gave to my daughter. She eats baked potatoes all the time. This saves her time and cost of heating is at a minimum. Recommend this to others that enjoy baked potatoes. Works great! Just what I needed. Have to add a little extra time to the cooking of the baked potato but, that&apos;s no problem, great product. A wonderful devise. I use it 4 out o5 evening meals. I liked it so much that I bought 4 more for my adult children. Makes making mashed potatoes SOOOO easy! This has been the GREATEST thing I have ever purchased!!! My husband and I love baked potatoes , but it takes so long to cook in the oven. Oh I forgot to mention sweet potato too yum. The only negative thing I may say about the potato express is that they say you can cook up to 4 potatoes in the bag in 4 minutes, not true. I get the best results by adding just 2 potatoes and cooking them for 8 minutes. But I&apos;m not complaining. It&apos;s better than waiting nearly an hour or so in the oven. The cooking time for large potatoes is too long and requires multiple cookings. Cooked 2 medium sized potatoes for 4 minutes...they did in fact need 1 additional minute (instructions suggest to do so if needed). I had seen this on TV and got it because of the ease. Works great, bigger tators take a little longer but turn out good. OK product, for the money. doesnt bake more than one potatoe in 4 min like in infers. 4 potatoes took about 10 min, but quicker than a conventional oven and better than naked microwave baking. Have only used once and the potatoes tasted great. They were large and it took a lot longer than the instructions said but that&apos;s ok. They tasted that good. Not like regular microwave &apos;taters. I would like to know where the other item listed on backorder is though. Do I need to reorder or what. I have to say, it&apos;s a great Item, we use ours all the time, it works as good as you say. It&apos;s very durable, and I am glad you can throw it in the wash. We love ours.